SPICED’s Graduates Win Goethe Institut Hackathon! 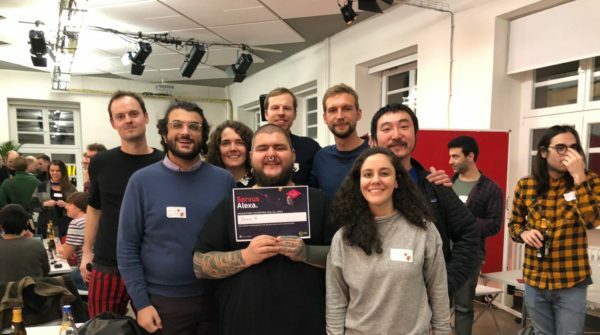 Last week a group of SPICED graduates from our Data Science and Full Stack Web Development courses emerged victorious in a Hackathon organized by N3XTCODERS and Goethe Institut, Berlin. Here they tell us all about the event, and how they ended up with the (figurative) trophy in their hands! Q: How did you hear about the Hackathon? What was your motivation to sign up? Marten: I wanted to do a Hackathon during the SPICED course, but didn’t feel ready to add value to a team project. After finishing the course and seeing during the final week what I can build on my own, I made it my bucket list challenge for 2019 to participate and quickly found the “Servus Alexa” Machine Learning Hackathon by Goethe Institute: N3XTCODE. Since I knew that Tommy, a fellow SPICED student from the Data Science course, wanted to do a hackathon as well, is very interested in language-learning, and experience in machine, asking him to do it together was an obvious choice. Tom: Marten and I had both discussed participating in Hackathons after the course. Marten then found this one, and sent me the details. We both chatted about it and decided to go for it. So I wouldn’t be here if it weren’t for Marten! Moritz: For me, I just heard “gamification” and was all in. I think my final project at SPICED, which was a game, inspired marten to ask me to join them. Q: What was the Hackathon about? Its main idea was to collect data (audio files) to train an AI to understand accented German, e.g. coming from Goethe students learning the language in their free-time or a classroom setting. In order to collect this data, we had to come up with a user-facing application, the data storage architecture and the machine learning model. Q: You worked as a team of Full Stack Web Developers and Data Scientists, what was your strategy to work together? Marten: We planned on building a simple adventure-based story in a “choose your own adventure” type style. Tommy had the idea to add visuals to our project, which was initially only based on audio. Therefore, we asked Moritz since he had build a functional browser game as his final project at SPICED. Moritz: At the actual hackathon there were more people who had applied to the hackathon as volunteers, without their own project ideas. So each “project owner” (which in our case was Tommy and Marten) got more team members to help in the process. We got 5 additional members, so our team consisted of 8 people. Marten: We split it tasks into “user app”, “machine learning model”, “presentation” and “story writing”. The “user app“ was split into “game visuals”, “speech recognition” and “server deployment”, which we split in our small developer team. Moritz: So while some of the “non tech”-people were working on the story for our game, others were working on the speech recognition and Tommy worked on the machine learning part, since he was the only Data Scientist in our team. Q: What was the idea of the project? Moritz: The idea we had was an adventure game in which you use your voice as a control input. The Goethe institute was looking for a way to collect data from non-native German speakers on how their accents sound because even modern speech recognition software often can’t understand people with an accent. So they wanted to train those systems to better understand accents and, therefore, they needed more data. Our game is supposed to teach people not only how to talk better German, but maybe also help them to cope with everyday situations better, like going to the Bürgeramt or checking in to an hotel. So there would be different “levels” or settings for you to play through. Of course we couldn’t really develop all of that so we only created a really small demo of the game and presented it together with our ideas and goals for the future. Q: How well did your bootcamp experience at SPICED prepare you for the technical challenges? Marten: I would say that it prepared us well technically and confidence-wise. As I mentioned, I wanted to do a Hackathon during the course before we went into Node.js and React. However, I was afraid that I would have to use something during the Hackathon that I have never used or is too advanced. technology to solve the most common use cases. Moritz: For my part, since I did a game as my final project with Phaser at SPICED, it really helped a lot (even though I taught Phaser to myself ;)). Also knowing how to set up a server, how GitHub works, how to set up a database… I was really surprised how well I was prepared to work with “real” experienced developers, and now I feel a lot more confident after seeing that it wasn’t as hard as I imagined! Tom: Very well, and for that I have to thank my excellent teacher Kristian. When we received feedback about why we’d won, one of the main points was that we had correctly identified the data collection challenges that the project posed, and attempted to solve them in a good way. We would have not been able to do this without the data science skills from SPICED. Q: Was it surprising that you won? What did you feel when you heard that you are the winner? 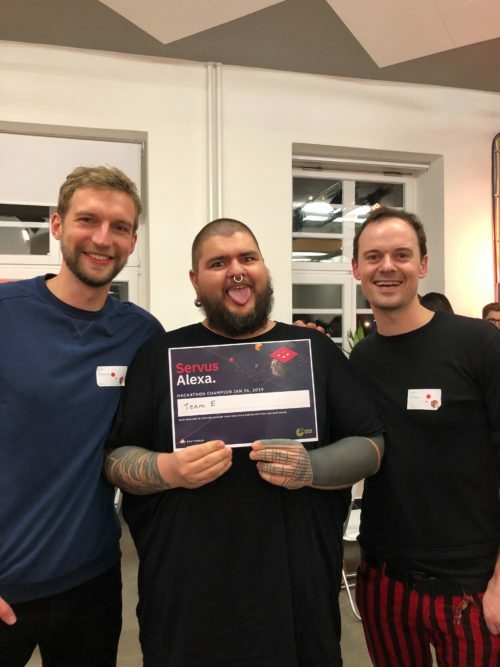 Moritz: Yeah for me it was totally surprising, our team – all 8 of us – had no Hackathon experience whatsoever, and we all agreed we just wanted to have a good time and see what this experience would bring us. In the end there were two winning teams, and the other one was like a really thought through concept of people who worked together for some time already, and then there was our team, a random bunch of people who wanted to have a great time. So we really all were super happy and excited and most of all surprised to win! Marten: Yes, I was definitely surprised! When I heard “Team E” as winner, I was too exhausted to fully comprehend so I just followed the others to the front and only realized after I saw their enthusiasm. Q: Would you change anything if you could do the Hackathon project again? Marten: I definitely have two points I want to implement for the next Hackathon: First off, Tommy and I didn’t know how much we could prepare beforehand, so we didn’t really prepare much at all (except for discussions about some ideas, the learning model theory and task distribution). Also, next time, as a project leader, I would try to have a clear strategy on how to get the product vision across to the team and how to split the tasks to implement this vision. Other than that, I love that you don’t know exactly what you are working with, so you have to be flexible to come up with solutions on the spot. Q: For many people, participating in their first Hackathon can be intimidating. What would you tell those people? Marten: First off, definitely do a Hackathon! I am not saying that only based on the positive experience we had, but in any case you will learn something new, even if you struggle to make a contribution. One of the things I like most about the tech scene is that people are open to helping each other (e.g. look at all the open source projects, Stack overflow answers etc.) and that feels like it’s true for a Hackathon in particular. I also recommend to pick a topic personally interests you, rather than something in which you are an absolute expert. Moritz: I wouldn’t have participated if Marten and Tommy hadn’t asked me to join. I didn’t feel prepared enough to apply to a Hackathon. But then I thought, what the hell. I can only learn something from it! Everybody was really nice. Nobody was condescending about not having any real world experience or Hackathon experience. It really was the perfect opportunity to peek into a Hackathon because it was a one day thing. I will definitely do another Hackathon, and I hope it will be as cool and fun as this one. Tom: Definitely do it! I honestly think no-one in the team had any expectations of winning up until the announcement, and we nonetheless were all saying how we felt it was a great. We learnt new skills, learnt how to work under time pressure, made new friends, and new contacts, none of which would have happened were it not for the experience. — Congratulations again to the SPICED team!